Genuine OEM Okidata Toner Cartridge, Magenta, 26,800 page yield. Okidata part number: 44947306. Color Laser Toner Cartridge compatible with Okidata CX3535, CX4545. Genuine OEM Okidata Toner Cartridge, Cyan, 26,800 page yield. Okidata part number: 44947307. Color Laser Toner Cartridge compatible with Okidata CX3535, CX4545. Genuine OEM Okidata Toner Cartridge, Yellow, 26,800 page yield. Okidata part number: 44947305. Color Laser Toner Cartridge compatible with Okidata CX3535, CX4545. 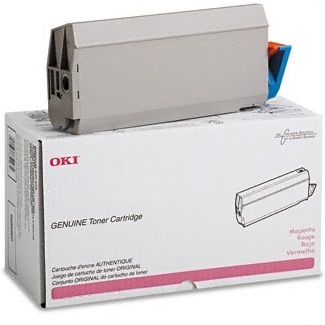 Genuine OEM Okidata Toner Cartridge, Black, 34,200 page yield. Okidata part number: 44947308. Laser Toner Cartridge compatible with Okidata CX3535, CX4545. Genuine OEM Okidata Waste Toner Container, 26,800 page yield. Okidata part number: 44953401. Waste Toner Container compatible with Okidata CX3535, CX4545. Genuine OEM Okidata Drum Unit, 77,000 page yield. Okidata part number: 44958001. Drum Unit compatible with Okidata CX3535, CX4545.